South Florida sportsmen enjoyed the Lobster mini season this week and I managed to get my hands on a couple of nice plump Florida spiny lobster tails. Having only two, I was at odds as to how to prepare them until I spoke to my wife who without hesitation exclaimed “Lobster Rolls!” Well, who am I to disappoint? Lobster Rolls it was. This presented something of a challenge considering that she was talking about the highly regarded Maine tradition of a simple “Maine” lobster salad stuffed into a wonderfully fresh, soft hot dog roll. Florida spiny lobster, quite a different animal from the Maine lobster, is also very different in both flavor and texture. I love them both but I wasn’t about to try to make my Florida lobster taste like the Maine version. Instead I set out to simply turn my lobster tails into the best lobster salad sandwich I could make and where does any good sandwich begin? With the bread of course! I have enjoyed some great Maine style lobster rolls and for me, the thing that always stood out was the foundation this sandwich was built upon; that sweet, soft, impeccably fresh hot dog roll. Not having access to any impeccably fresh hot dog rolls it occurred to me that I work right around the corner from Direct From Philly, a very good, authentic Philly cheesesteak shop that uses rolls shipped in from the famous Amoroso’s bakery in Philadelphia. The owner of Direct From Philly obviously appreciates good food and he loved the idea of the lobster rolls and very happily sold me a couple of fresh Amoroso’s rolls. So while they weren’t impeccably fresh hot dog rolls; I had found my foundation! Once the lobster was cooked I chilled it for a half hour to get it to the right temperature for a salad. Then, following the lead of our friends in the great state of Maine, I kept it simple. Using just the minimal ingredients to compliment, allowing the flavor of that lobster to be the star. If you try the recipe I recommend using the tender, white celery branches from the inside of the celery so you don’t have to worry about peeling. Also, if you really want to put a Florida spin on this sandwich; try a little key lime juice instead of the lemon. So what was the final verdict from my wife? “Mmmmm” was pretty much all she said…she was just too busy enjoying her fresh “Florida” lobster roll to do much talking! Pre-heat the broiler then split the lobster tails, brush with 2 Tbsp melted butter, and broil until just cooked through, being careful not to overcook. Remove the lobster meat from the tails and refrigerate at least 30 minutes before continuing. When the lobster is chilled, split your bread and spread it with butter then place in the toaster over or broil to toast. Remove the bread and cool slightly before adding your lobster salad. While the bread is cooling use your fingers (and a knife) to pull your lobster into bite sized pieces and chunks. Toss the lobster meat in a bowl with the remaining ingredients, using just enough of the mayonnaise to coat the lobster. Fill each sandwich with a generous portion of the lobster salad, trim the ends of the bread just up to the edges of the filling, and serve. 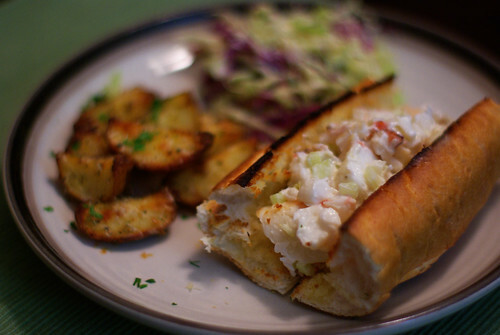 This entry was posted in Entree, Seafood and tagged Amoroso, bread, Direct From Philly, Florida, lemon, Lobster, mayonnaise, recipe, Recipes, Roll, Rolls, Spiny, Tails. Bookmark the permalink. Thanks for the recipe Randy! Really easy and delish!!!!! Yes, seriously Mike. I specifically wrote “broil until just cooked through” for a very good reason. If I had said “Broil for 8 minutes” that would be perfect for a 6 ounce lobster tail but what if your tails were only 4 ounces? Then you would be calling me an idiot because your lobster tails were overcooked! If you try this recipe I must recommend that you broil your lobster tails “until just cooked through”. No longer and no less. Seriously? You have directions on how to cook lobster and say “don’t overcook” but you don’t mention how long to cool the tails? You are an idiot. Mike, how rude of you. Shame shame shame on you. You are what is wrong with the world today and you should have apologized. ignorant. You felt you needed to call someone an idiot over a recipe? wow.